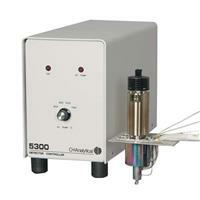 The Model 5360 XSD™ offers superior selectivity for detection of halogen-containing compounds. Installed in the standard port of a gas chromatograph (GC), the Model 5360 XSD™ detects halogen-containing compounds eluting from the GC’s capillary column. This instrument is unique in the fact that it doesn’t contain radioactive sources or use organic solvents like other halogen selective detectors. This eliminates the need for catalyst tubes, solvents, resin cartridges, pumps, and transfer lines. The 5360A XSD™ option offers a heated base assembly which provides improved baseline stability and easy column installation. Both the 5360 and 5360A models can be installed as stand-alone detectors or used in tandem with the Model 4430 Photoionization Detector (PID).